The carrier is ordering 60 of Airbus’s A220 jets, the freshly re-christened plane formerly known as Bombardier’s C Series. JetBlue Airways is placing a big bet on Airbus’ newest jetliner. The carrier is ordering 60 of Airbus’ A220 jets, the freshly re-christened plane formerly known as Bombardier’s CSeries. Tuesday’s sale is the first since Airbus took control of the aircraft program last week from Bombardier. The JetBlue order is valued at $5.4 billion based on list prices, but customary discounts would bring the total down to about $2.2 billion based on estimates from aircraft-valuation firm Avitas. The deal caps JetBlue’s long search for a more efficient small jet to replace its Embraer E190 aircraft, which it relies on to ferry passengers on such routes as Boston to New York. 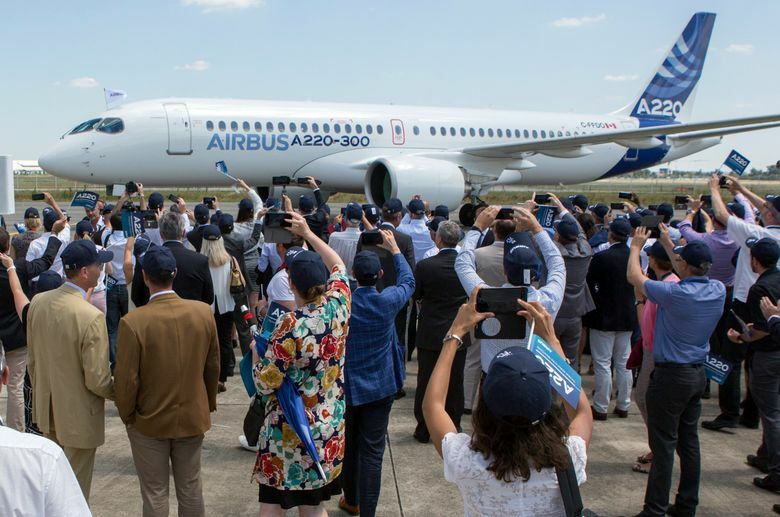 The order also provides an immediate impetus for the A220, suggesting that Airbus will be able to entice more airlines to buy the plane. For Airbus, quickly racking up orders for the A220 is a crucial challenge as the Toulouse, France-based company seeks to lower costs. To make the aircraft viable, the planemaker says it needs a “double-digit” reduction in costs in its supply chain and is in the process of negotiating with suppliers. For JetBlue, the transaction will yield an all-Airbus fleet, which Priest called an “undoubted advantage” because it will reduce costs for items such as parts and training. When all 60 planes are in its fleet, they will reduce the carrier’s annual cost for each seat mile flown by 5 percentage points and add about 3 percentage points to its pretax profit margin, Priest said. Deliveries of the A220-300 planes are scheduled to begin in 2020. JetBlue also took an option to buy as many as 60 more starting in 2025. The A220-300 burns 40 percent less fuel per seat than the E190s, has lower emissions and isn’t as loud, JetBlue said. The aircraft also is capable of flying cross-country, something JetBlue anticipates doing eventually, said Marty St. George, the carrier’s executive vice president. While JetBlue first talked with Montreal-based Bombardier as far back as 2015, it began a formal fleet review about 15 months ago. In a hotly contested battle, the carrier considered replacing its 60 E190 planes with Embraer’s upgraded E190-E2 model or the larger E195-E2. JetBlue hasn’t arranged financing for the aircraft yet but expects to use a combination of cash and debt, Priest said. The planes will use Pratt & Whitney geared turbofan engines. JetBlue’s E190s — 30 owned by the airline and 30 leased — will be phased out gradually through 2025. The carrier also made changes to its existing Airbus order book, including the conversion of an existing deal for 25 A320neo aircraft to larger A321neos. JetBlue will move two A321 deliveries to 2020 from 2021 and defer seven to 2024 that originally were to arrive in the 2021-2022 period, JetBlue said. Airbus has committed to extending its factory in Mobile, Alabama, to build the aircraft. That would add to Bombardier’s existing plant in Mirabel, Quebec. Airbus is taking control of the CSeries after the jet struggled for buyers amid concerns about its feasibility, resulting in a cash injection from Quebec and a loan from Canada’s federal government. That sparked a trade complaint last year from Boeing, prompting the U.S. to impose duties that threatened to further subdue sales. The tariffs were later blocked but not before Airbus had agreed to acquire control of the program. The European planemaker scrapped the CSeries’ 14-year-old branding and renamed it the A220 as it slots in below the A320 family of narrowbody jets. Bombardier, which invested more than $6 billion in the program, will retain a minority holding. Boeing announced a preliminary agreement last week to form a $4.75 billion venture with Embraer that will control the Brazilian manufacturer’s commercial airplane and services business.